It is starting to sink in that my children, if I have some, will probably have a very different childhood from mine. Not only because they are younger and the world has changed. The smell of the air, the quality of the light, it will be different. The seasons. For them good ice cream will not be a regular treat to be had most summer days. They will probably never have the kind of skills you need to order an espresso in an overcrowded bar and drink it in the tiny little space you have conquered, without burning your tongue. They may even want to drink cappuccino after four o’clock (quelle horreur!). They won’t stop in a panetteria to buy hot focaccia or pizzette. Eating sun-bursting apricots or figs when in season will be an out-of-ordinary experience, not something that happens every year, if you wait for the right moment. They would have other experiences, sure, and I think there are many positive ones to be had in this country, with its huge coastline, the smell of the ocean everywhere, the mild climate and the careful drivers. One of my colleagues in the summer gets home from the office at five, puts on the children’s wetsuits, and walks to the beach ‘down the road’ to make them play for an hour or two in the rock pools. And he surely is no Rockefeller. I can’t think of many places in Italy where you can afford that – although, you probably won’t need a wetsuit. But there is more that worrying about the formative experiences of hypothetical would-be children. Cultural differences at times explode; one such moment is when I am feeling unwell. The way doctors behave changes dramatically from country to country. In Germany I have been prescribed millions of exams and met with a quite ‘invasive’ attitude. They always told me bluntly what can go wrong, without giving much hope: a five per cent chance of failure will be given as a hard fact. Here they will care more about how the patient feels as a whole, but sometimes it is a bit irritating when you are made to feel responsible for deciding your own cure – I’m not the specialist after all! They won’t prescribe a lot of medicines that will be used ‘in Europe’, as they say, but they will be even too generous with the pain killers. Also their non invasive approach can be quite challenging if you expect the doctor to ‘do something’. By the way, if you are wondering how this works in Italy, don’t expect painkillers, ever. As you may have guessed, I had some more medical problems lately. Touching wood, I hope they are solved for good now, but I’m a bit fed up of dealing with doctors. I am not talking about huge problems here, don’t get me wrong. I did not move to a wildly different place. In Europe we have so many centuries of living in the same house, and like many too intimate neighbours, we like to underline our differences instead of forgetting about them. There are many tiny differences of course, but nothing major. I always thought the biggest one is the food. Actually, I think this one is changing. I can see what you meant when you said it needn’t be that bad. Here food is a world apart from my bad experiences in Wales. There is a lot of attention surrounding it, and I have the embarrassment of choice on local, organic, seasonal products. There are also several places that cook this gorgeous product without spoiling it. There’s even a bakery that makes decent sourdough – nothing like Germany of course, but quite different from the inedible loaves of chain bakeries. Lately I’ve started living with a vegetable box. I find it quite entertaining so far, although we are about to face the hungry gap here. I find it funny to have to deal with vegetables I would not have chosen otherwise. It helps that they are always very good quality and fresher than anything I can buy otherwise. As you may easily guess, the stars in this season are the usual boring suspects: leeks, variations of brassicas and variations of roots. Which brings me to scratching the bottom of my creativity with carrots. I’ve been looking back at my past history. The longest relationship I’ve ever had in my life so far was also the first one. It lasted almost ten years, spanning from high school to university. We changed through the years, and then as it was probably natural, at some point it did not work any more. Given our age, his mum was quite an inevitable presence during our years together. I realize only now that she must have been almost my age now: she had her only son when she was very, very young. She was a charming and intelligent woman with some harsh bits – just my kind of person, although our relationship was not always easy. She had an amazing talent for theatre: she could easily have been an actress, had circumstances been different. She did not particularly enjoy cooking, although I’m sure she enjoyed food: it was one thing that needed to be done, and she was always busy. She came from Naples although I think she spent most of her adult life in Milan, and this reflected in her cooking. Feeding her family for her was making huge pots of pasta with a lot of vegetables and an incredible amount of oil, to be stored in the fridge and reheated repeatedly. It did work quite well, if you put enough oil on it and don’t mind your pasta a bit soft. She taught me a number of dishes that I still prepare. One of them is frittata di maccheroni (see here for Simona’s lovely twists on it), another one was her favourite detox dish, scarola soup; and these roasted carrots. I did all but forget about them until I was desperate to find yet another recipe with carrots. She prepared the recipe with an outrageous amount of olive oil; I did cut it down a bit. The main problem with this recipe is that I should really use a mandolin – I need to order one, but I’m not sure about the model: if you have any suggestions, please leave them! You slice and roast a kilo of carrots and end up with three-four scant portions (they are intense, so although they don’t look huge, they’ll leave you satisfied). Despite all the knife work involved, this has become one of our regulars, and I find myself actually quite looking forward to the next carrot delivery. If carrots are fresh and organic, and not too full of mud, I don’t peel them; but sometimes peeling is actually easier than scrubbing the dirt clean, so I’m flexible on it. Preheat the oven to 220 Celsius. Slice the carrots in thin rounds, about 1-2 mm thick, as regular as possible. Peel the garlic cloves and slice them as thin as you can. Peel and slice the ginger as well; if you don’t want to risk eating a slice of caramelized ginger, grate it instead. Mix all the slices on a roasting tray (you can cover it with parchment paper for really easy clean), add in a lot of black pepper, salt and a generous tablespoon of olive oil. Mix well again: I use my hands, it is the easiest way. Roast the carrots, turning them and the pan every five/ten minutes or so, depending on how even your oven is. If they start to dry out really quickly add a tablespoon of water to the roasting pan. After about 30-40 minutes, the carrots will have wilted considerably and look dried. The actual cooking time will vary a lot with the carrots. Now you need to watch them quite carefully, because they go from caramelized to burnt in a few minutes, but it is these last minutes that make all the difference in flavour. 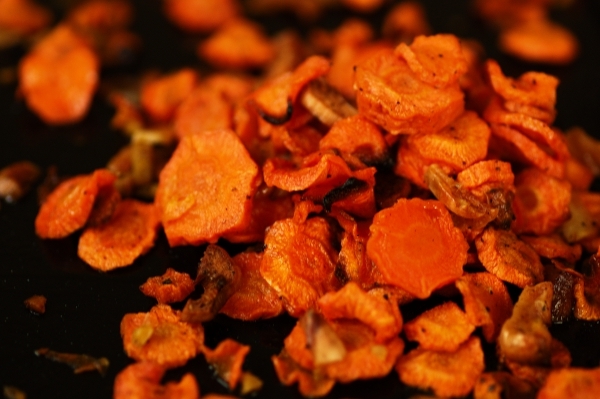 Take them out when they are as dark as you dare – golden brown carrots will be the best morsels. Serve hot or cold. Mmmm, the carrot slices look so concentrated and crunchy. As for the twists and turns of life… I guess you just have to go with the flow, or swim to a place where you feel more comfortable. That is a lovely recipe! Carrots pair so well with ginger. I’m so sorry to hear about the fact that your move had left you shattered… I hope you’ll feel better soon. I almost got teary when I read the beginning of your post, because that is exactly how I feel about my childlren. My kids will be priviledged to experience all the things your wrote about but their childhood is different from mine and foreign to me, although I have been living in Italy for most of my life now. It is strange and painful to a degree when I hear my children speaking English (the little they speak so far) with an accent and saying they are Italian. Don’t get me wrong, there is nothing bad about that at all but it is not me and my children are my flesh and bones yet they are so not me and that physically hurts. I think you cannot understand that fully until you live somewhere that is not your country of origin, as lovely as your new home may be. Regarding the mandolin, I have a Kyocera with a ceramic blade and love it (http://nutsaboutfooditaly.blogspot.co.uk/2010/07/about-love-affairs-asian-style-chicken.html). so many things in here that has me nodding. your worries about your hypothetical children are the same as the mine i have about my child. how will she know the inner sounds, smells and rhythm of india. The smell of the monsoon, the sound of hawkers. and then, getting used to doctors who ask you what you think is ailing you, and how you might like to cure it. even the bit about the vegetable box – i’ve been meaning to make that shift for a while. i want to be surprised, challenged. i have a bag of carrots in the fridge though, so i am going to borrow your recipe today. i hope your health heals, and you see much less of your doctor.